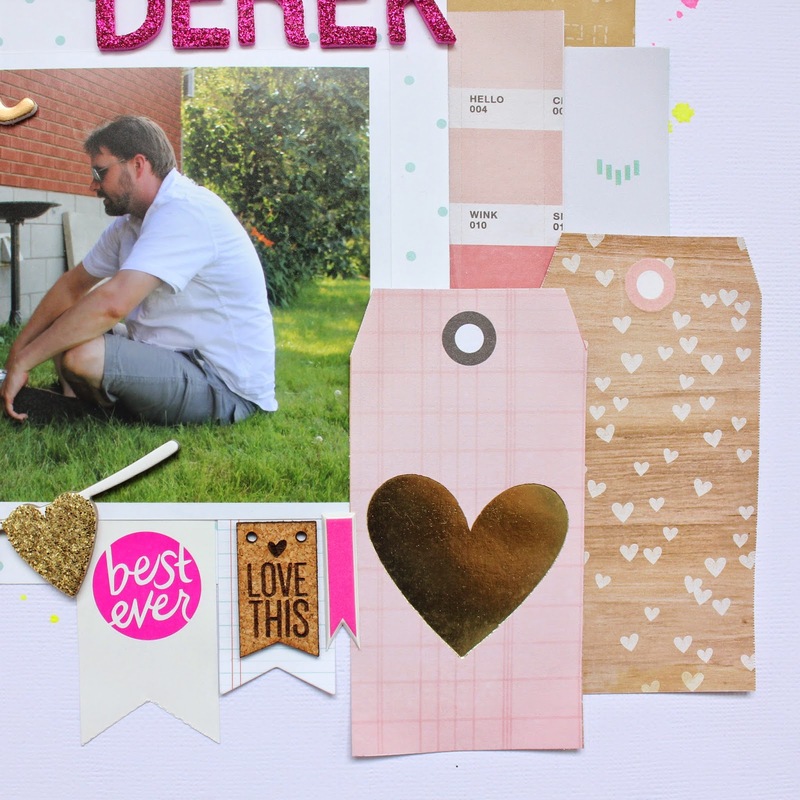 Layout #4 with the Hip Kit Club main kit and embellishment kit. The layout is about how my niece, Ruby Sky calls Derek her "very best Derek". This is especially amazing considering when she was a baby, she would scream when she saw him. She's come a long way and now she just adores him. 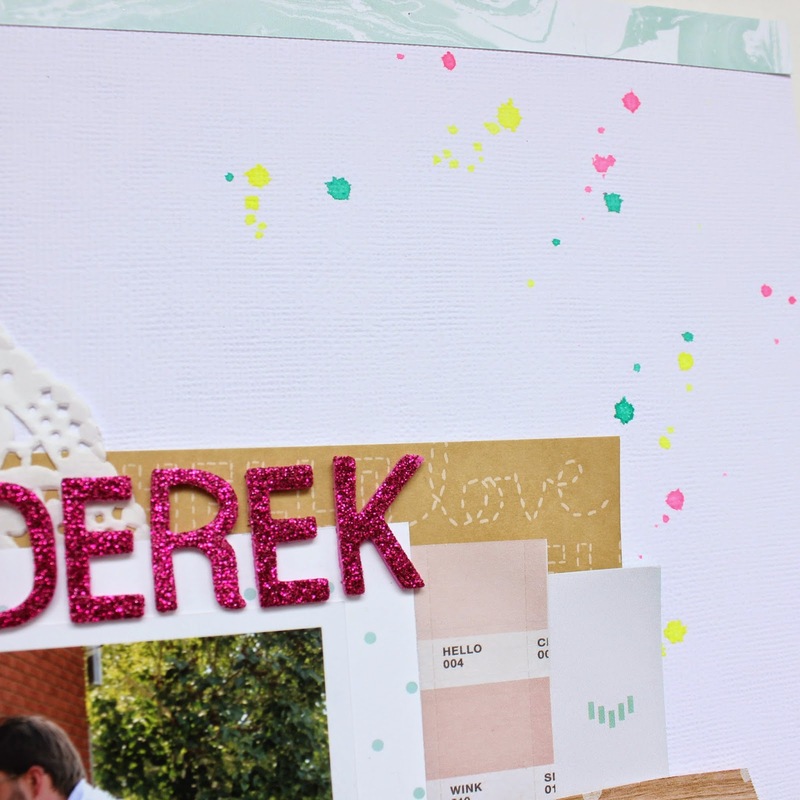 This layout has basically all of my favourite scrapbooking components: gold, glitter, pink (especially neon pink), doilies, and Thickers. If only I had thrown a few enamel dots down and a strip of washi, it would truly have had it all. 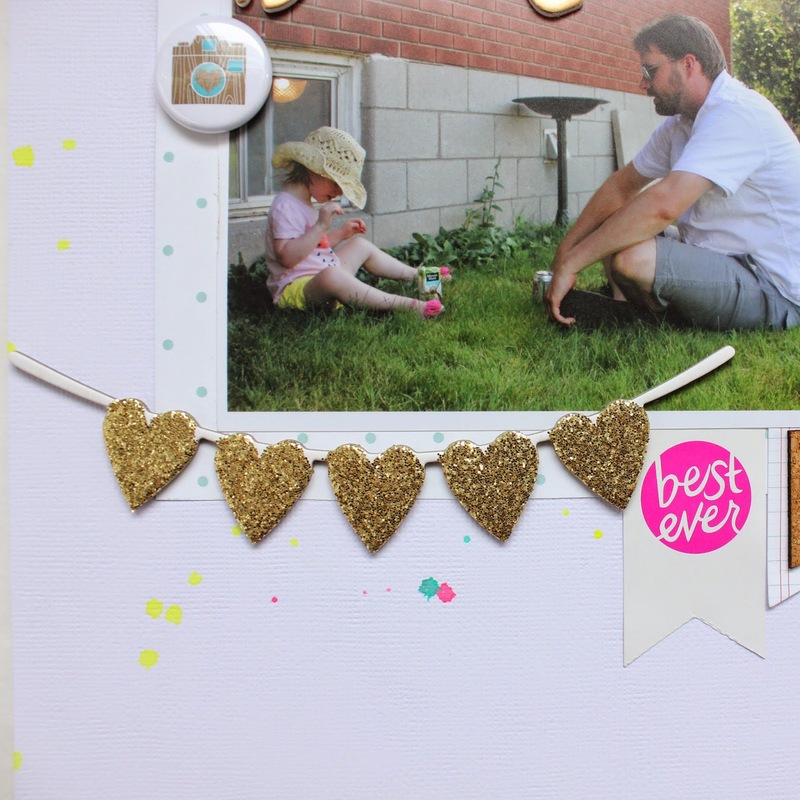 I just love this gold glitter heart banner that from the Crate Paper Kiss Kiss 12x12 chipboard stickers. It was very hard to use it here and not hoard it. I layereed some banner pieces and a few tags from the Crate Paper Kiss Kiss cut apart die cut sheet. I love that sheet and it was also very hard not to hoard that. I then layered a few patterned papers behind the tags. The Thicker "best" came in the December kit, but it was perfect for this layout title. I really love those Amy Tangetine Thickers. They are glittery and an amazingly bright pink. Definitely a new favourite. I finished the layout by misting three different Mister Huey's in neon colours. They are bright, the photo definitely does not do them justice. Studio Calico sold these for a limited time a few years ago and are no longer available. I use them very sparingly for this reason, but they were perfect for the brightness of this layout. I am getting the entire day to myself on Saturday and I plan on locking myself in my scraproom to knock out as many pages with this kit as I can and am only coming up to refill my coffee mug. The February kit starts to ship on Monday and I really want to have it as close to killed as possible by then.